Home > Archives > Contests > Win Tickets to the 90th Anniversary Pickford/Fairbanks Double-Feature May 14 in Los Angeles! FIVE lucky winners will each receive a pair of tickets to the 90th Anniversary Double-Feature of Mary Pickford's Sparrows and Douglas Fairbanks' The Black Pirate at the Egyptian Theatre in Los Angeles, CA on Saturday, May 14! Ninety years ago, on May 14, 1926, Sid Grauman held a double premiere of the latest films by two of his favorite stars—husband and wife, Mary Pickford and Douglas Fairbanks. 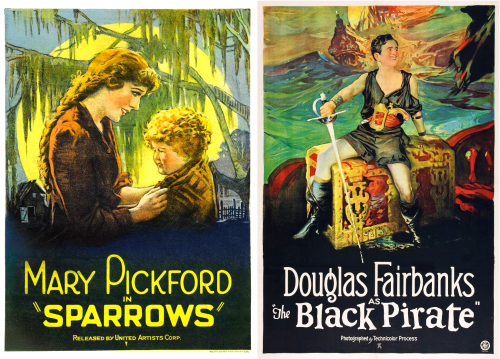 Mary Pickford's Sparrows played first, followed by Douglas Fairbanks in The Black Pirate! It may well be the only time that a double premiere was ever held at the Egyptian Theatre or anywhere else! On Saturday, May 14, the Egyptian Theatre will recreate Grauman's "Doug and Mary Premiere." First the audience will be moved to tears as Mary, playing but an adolescent herself, provides the mistreated orphans on a "baby farm," near a swamp infested with alligators, with some maternal care, while Doug swashbuckles on the high seas in the second feature! Pickford scholar and My First Time In Hollywood author Cari Beauchamp will introduce Sparrows and Fairbanks biographer (The First King of Hollywood) Tracey Goessel will introduce The Black Pirate. Both speakers will sign books in the lobby before the films and at intermission. The original program for the evening details the Sid Grauman-orchestrated prologues. In the spirit of the premiere night 90 years ago, the American Cinematheque will present their version of "The Duel Dance of the Buccaneer Beauties" prior to The Black Pirate—and a few other live performance surprises! 35mm print of Sparrows courtesy of the UCLA Film & Television Archive. 35mm print of The Black Pirate courtesy of the British Film Institute. Tickets are available at the box office or online here: $15 General, $13 Student/Senior (available at the box office only), $11 Cinematheque Members. No Passes Accepted. Subscribe to the Flicker Alley newsletter below for a chance to win a pair of tickets! Shot in two-strip Technicolor, The Black Pirate stars Douglas Fairbanks in the title role as a nobleman who vows revenge on the brigands who killed his father, and joins their crew to exact it. Damsel-in-distress Billie Dove might distract him from his mission, but Fairbanks is in his element as a buccaneer – the sequence in which he single-handedly captures a ship will leave you in awe. See Official Rules link below for details. Giveaway ends 5/10/16 at 11:59 p.m. PST.